Of course mullet are anything but uncatchable. Over the years I've caught thousands of these fish using a wide variety of methods from float fished bread to spun ragorm and fly fished maggots. 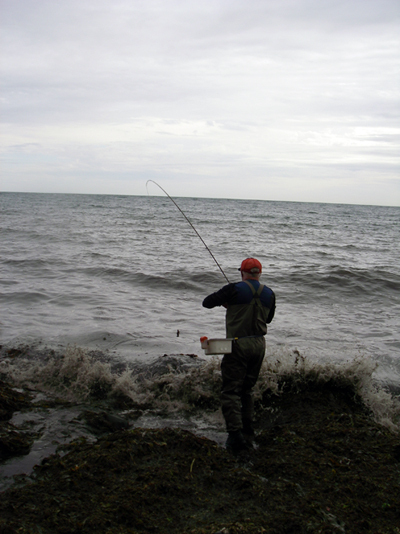 However, there are times when it is difficult to tempt these fish and it usually relates to the conditions. 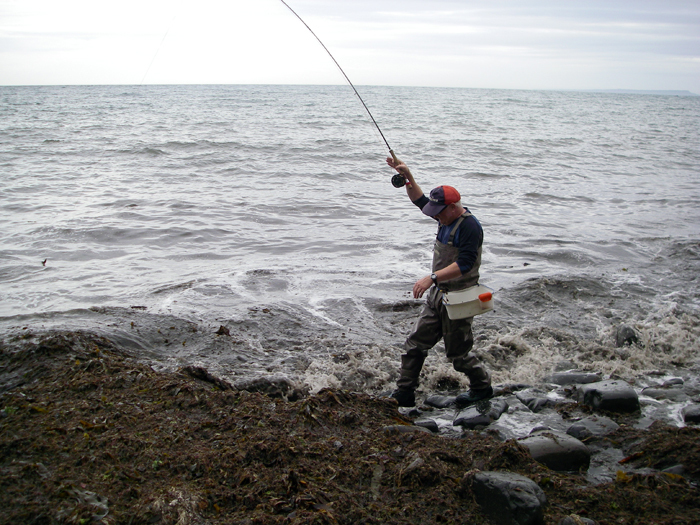 On the recent spring tides Nigel and I decided to have a go at fly fishing along the Purbeck coast. High water was predicted to be about 18:30hr so we'd arranged to meet, in the car park, an hour or so before that. In practice Nigel was a bit early and I was a bit late so when I saw his parked car I grabbed the gear and set off in pursuit. I'd walked a few hundred metres along the beach when I spotted a nice shoal of mullet feeding on the top. It was tempting to stop and have a quick cast but I opted to press on after my pal. Five or ten minutes later when I caught him up he was just setting up his fly rod and in front of us the mullet were beginning to shoal up. No need to chuck any weed in tonight - the waves and tide were already washing tonnes of the stuff into the sea and I commented that 'if' we hooked a mullet the problem would be landing it - prophetic words! We both began to cast maggot baited flies to the mullet and almost before I'd got a line out I turned to see Nigel's rod well bent into a fish. I reeled in, grabbed the camera and began to take pictures of the battle. 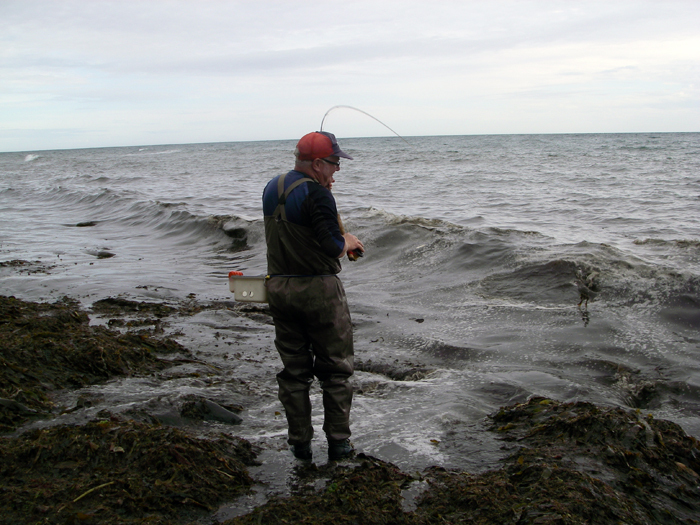 My pal slipped and slithered over the weedy boulders trying to avoid a soaking as he played his fish. It fought in typical mullet fashin with a series of runs but eventually he had it close to the shore. I suppose that, at this point, I should have put down the camera and tried to lend a hand but Nigel is well used to landing fish in difficult conditions so I left him to it. All seemed to be going well with the mullet sliding, head up, over the weed soup but suddenly it plunged into the drifting crap. Nigel heaved back on the rod and seemed to be gaining. There was only a metre or so between the fish and the 'dry' land but it was no good. 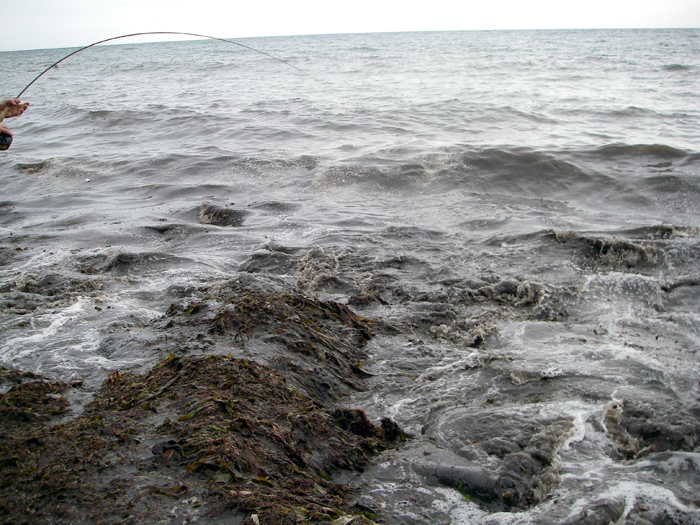 The weight of the mullet plus several kilos of weed proved too much, the hook hold gave and the mullet swam off. The fish moved further out after this and we caught nothing else!!!! !